This post is authored by CARA researchers Michal Kramarek and Fr. Thomas Gaunt, SJ (also CARA's Executive Director). It provides a brief look at the contribution of religious sisters to the parochial schools in the United States. The bibliographic information for the references included in the text can be found here. 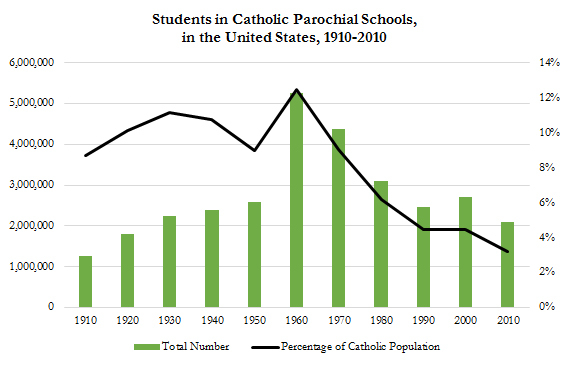 Written discourse about Catholic parochial schools in the United States has been in decline since 1970’s. 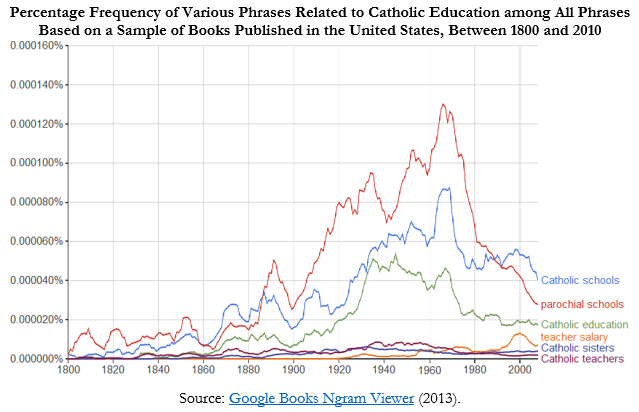 In fact, after enjoying over a century of higher attention, the frequency with which the topic appears in American publications in recent years is reverting to levels prior to the Third Plenary Council of Baltimore of 1884 (as shown in the chart below). In 1960, there were 68 Catholic schools for every 100 Catholic parishes (Kenedy 1961). In 1963-1964, there was an all-time high of 13,205 Catholic elementary and secondary schools (Snyder 1993, 49). In 1965-1966, there was an all-time high of 5.6 million baby boomers in Catholic elementary and secondary schools which constituted 87 percent of nonpublic school enrollment (Hunt and Kunkel 1988, 277) and 12 percent of the entire Catholic population (Kenedy 1966). In the 1960s, “[t]here was hardly a town of more than 30,000 inhabitants in the United States lacking a parochial school” (Stewart 1994, 428). Those remarkable accomplishments bring about the issue of how it was all possible. After all, the financial cost of such an undertaking must have been considerable. Or, was it? The answer to this question depends on the point of reference. For example, Burns (1912, 290-293) estimated the overall cost of education in Catholic parish schools nationwide (including cost of maintenance, salaries, supplies, apparatus, heat and light, repairs, interest and insurance), in 1909, at $9,898,008 ($268 million in 2017 dollars). By comparison, he estimated the cost of the equivalent education in public schools to be over three times higher, at $30,511,010. The rise and decline of Catholic parochial schools appears to be partially a function of changes in the relative cost of operating those schools. The changes in relative cost were, in turn, primarily driven by the immense sacrificial service contributed by religious sisters (e.g., Burns 1912, 284; Stewart 1994, 327). In strictly financial terms, this sacrificial service can be measured as the difference between the amount of salary received by lay teachers in public schools and the amount of salary-equivalent/stipend received by religious sisters in parochial schools (i.e., the salary forgone, for a lack of better term) multiplied by the number of religious sisters in teaching positions. 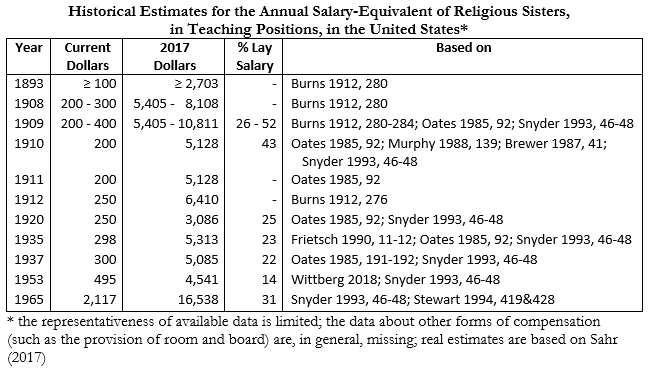 In regard to the first factor, the salary forgone, the table below summarizes available historical estimates for the stipend of religious sisters in teaching positions. In available years, this stipend was roughly one quarter of the salary of lay teachers in public schools. A caveat should be added that this comparison, while illustrative, is severely limited, because it does not account for many differences between the two groups (e.g., value of room and board, educational requirements, average amount of teaching experience, additional sources of income, retirement funding, or cost of living). 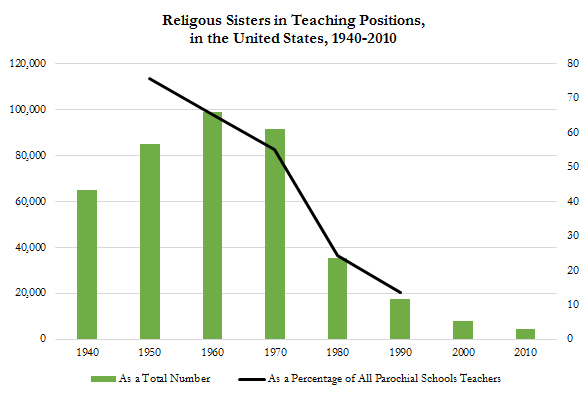 In regard to the second factor lowering the cost of parochial schools, the chart below shows the number of religious sisters in teaching positions. Notably, the highest number of religious sisters in teaching positions was recorded in 1965 when the parochial system was about to reach its all-time high (as described above). However, the number of religious sisters as a percentage of all teachers in parochial schools was already in decline, which might be an indication that the salary cost increase outpaced the system growth. This might have exacerbated the decline beyond what was the result of decreasing number of religious sisters in the following decades. A caveat should be added here that other reasons also played a role in the decline of the parochial school system. Those reasons include, for example, public school systems catching up with the rapid population growth, the migration of Catholic population from cities to suburbs, and from Northeast to West (thus away from places where parochial schools were established). So, how much of the difference did the religious sisters make? What was their contribution as measured by, so to speak, the amount of forgone salary? In 1965, when the Catholic education system was at its largest, an estimated 103,314 religious sisters held teaching positions (Stewart 1994, 419). In this period, religious sisters received approximately one third of the salaries made by lay teachers in Catholic schools (Hesburgh, Hochwalt, and Shuster 1966) and salaries of lay teachers in Catholic schools were 5 percent to 10 percent lower than salaries of lay teachers in public schools (Koob and Shaw 1970). The annual amount of salary paid to lay teachers in public schools was $6,935 (Snyder 1993, 46-48). Based on those numbers, the sacrificial service of religious sisters teaching in Catholic schools in 1965 alone allowed the Catholic schools to save an estimated $0.5 billion ($3.8 billion in 2017 dollars) relative to public schools. It is important to point out that those large aggregate amounts are only possible due to daily sacrifices of religious sisters that accrued over a lifetime of teaching work. “[The] phenomenal expansion [of the parochial schools] would have been impossible without sacrificial giving by laity and commitment by the rapidly increasing numbers of sisters who taught without remuneration beyond bare subsistence” (Stewart 1994, 322). While the attention of those leading the discourse about the needs of the Catholic community in the United States shifts to other, important topics, we may be well advised to remember the extraordinary financial contribution that tens of thousands of sisters made to the Catholic Church each year for decades- as much as $3.8 billion in a single year. 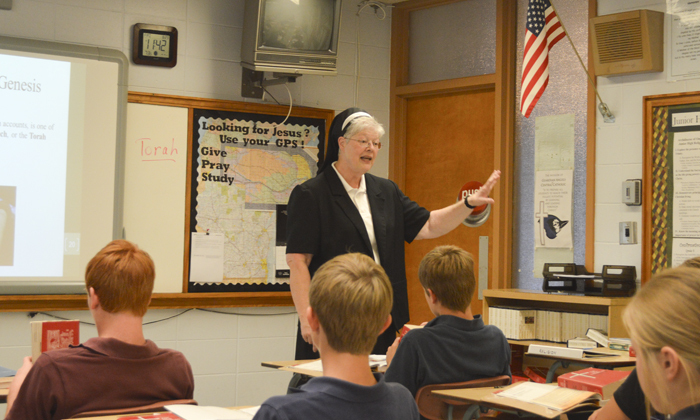 Top image source: Sister Joellen Kohlmann teaching religion at Guardian Angels Central Catholic High School from “Nuns getting harder to find in Catholic schools.” Please read this story for more context to the research presented in this post. Photographer and author of that story: Jerry Guenther, Norfolk Daily News.